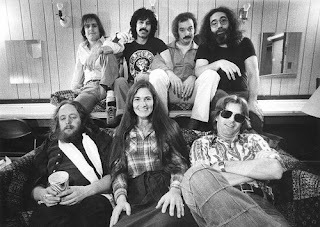 In the long musical history of the Grateful Dead, 1977 is clearly the most famous year. It’s an odd thing, and I can’t really pin down the reason why – but in my case, that year never filled me with the desire to collect every single note of it. Where I did make it a mission to get absolutely every drop of years like 1973, 74, 76, and 78 in the 70's, there must have been something about 1977 that didn’t set off this same spark. It probably had to do, in part, with the ’77 shows I collected early on not scratching some sort of itch like other shows. And it might have been a little bit of my rooting for the underdogs of 1976 and 1978 – two years that have always suffered in popularity due to being in such close orbit to the behemoth of 1977. I kept finding great music (to my ear) in ’76 and ’78 hiding in shadows, and it focused my collecting skills to get more and more. For whatever reason(s), for me 1977 was never the bees knees that it was for so many other folks. Hey, one man certainly gathers what another man spills. The show quickly became a personal favorite, going against my general feelings about 1977. The performance brims with that certain energetic enthusiasm so easily associated with ‘77. The band is hot, smooth, focused, and bubbling right out of the gate. A slew of fun first set tunes is elevated by a sensational 40 plus minute set closing Terrapin > Playin’ > Samson > Playin’. Terrapin Station was about as new as new could be here, in the midst of the band auditioning it in different points of the show to see where it might find a final home. It’s a lovely early version. Then things catapult to the stars with Playin’ In The Band. The Playin’ jam begins with Jerry buoyed atop soft undulating waves of sound slowly seeping out of the other instruments. Keith, in particular, is working some lovely magic out of his keys, drifting in and out of view. The entire passage pulls the listener’s ear down to the subtle layers of music below the fray. In fact, the fray is utterly missing here. It’s as if we’ve wandered into an undisturbed patch of forest glen, a knoll where dust, dew, and sunlight have slept for centuries. Slowly, our steps into this scene melt into the ground itself. We disturb nothing, dissolving into the musical landscape, bodies as much moss and mist as flesh and bone. Energy grows like sun speckled breezes after dawn. Slowly there come more distinct shapes and patterns. 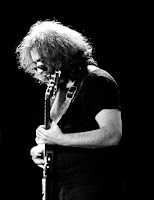 Deep in the jam, Garcia explores his effects rack and begins digging into his distortions, compressions, and flanges, dipping into some of the tones that would later work their way into other songs. And then there come the great slow motion geysers of leads catching fire as if Jerry had been working dry tinder to the point where it ignites under his careful attention. These leads soar out of his hands and bloom into the air as fountains unencumbered by gravity. Laughing colors mushroom overhead. Jerry changes tone and sends another fountain out into the air. Soon it feels like we are sitting in a grove of these towering, slow moving sprays of music. These passages are riveting on the AUD tape, and luckily, the SBD tape manages to bring across the same sense of exploding light out of darkness, making for a wonderful listening adventure. Under the cover of dark, the band builds the foundation of Sampson And Delilah, and with that they are off to the races. The version rocks mightily along, and even on the soundboard you can hear the frenzy of the crowd. The song transitions back to Playin’ in a nearly perfect transition. It’s hard to say if Jerry entered one measure too soon, or if Bobby and Donna blew it by tearing that old building down just one time too many. Regardless, the transition still scores close to an A+ on the pleasure factor, quickly sweeping everything back into the fairyland forest where sunlight caresses tree bark and dust specs alike into hundreds of colors. There are more passages where energy soars and the music spins. The Playin’ theme returns, but takes a sweet long time to fully mature back into the final stanzas of the song, bringing the set to a close. Eyes Of The World opens set two and feels like a 9 out of 10 on the energy scale. It’s as if the band hasn’t skipped a beat coming out of set one. They spend the first few minutes delightfully exploring the song’s theme before Jerry steps to the mic. This is the late 70’s style Eyes. The tempo is much faster than it was back in ’73-’74, and here Garcia is fully loaded with the joyous energy that this tune would come to exude throughout the band’s career. It’s just one power packed, smile inducing ride after another. Garcia’s play embodies everything we think of when we say he was “soaring.” He is wingspan full, high in the sky, flying here. Eventually, the song rolls out into a gurgling pool of ripples and waves that churn in colored oils mixed with the spray of crystal waters. Pure Space elements begin to flood vision, dislodging our sense of stability. Phil’s bass throbs and groans. Jerry flips on the auto filter and we can hear Dancin’ In The Streets brewing. Garcia’s soloing on Dancin’ is electrifying, as much the pure essence of this song that we generally associate with the ever-famous 05/08/77. He finds his way into wonderful riffs and melodic lines, each of which build over the other. It’s early in 1977, but already he has complete mastery of his “'77 Dancin’ sound,” and he uses it to push on and on into gorgeous pockets of themes and syncopated lines. His tone burns through the air, and ripples through the music. This is hallmark 1977 goodness. Eventually, things simmer down and Jerry turns a corner into Wharf Rat. It’s a good version which ends with Garcia sending spiraling lines out in a triumphant musical march landing at a total rest from which he twists directly into Franklin’s Tower. While it would come to happen more often as the years went on, at this point, this was only the third time that Franklin’s showed up in a set list *not* coming out of Help>Slip. And it’s one fantastic version. The song is filled with one star exploding solo section after another, rocketing the energy into the heavens over and over again. Perhaps it is all fueled early on when Garcia blows the lyrics of a verse and comes back with an over delivered “If you get confused, listen to the music play!” that launches him into the first of many truly blistering solos. One after the other, he blasts over the top, only to outdo himself on the next one. From Frankin’s we make it to Sugar Magnolia, and if you’re thirsting for a little bit of hard rockin’ Grateful Dead, look no further. It starts off feeling a little slow, but eventually delivers with devastating force to end the set. The show wraps up with a double encore of One More Saturday Night and Uncle John’s Band, a perfect end to one darn near perfect evening of Grateful Dead music. Curiously, the AUD of this show is not currently in online digital circulation. But, I do recall being far more drawn to the SBD after it came around whenever I thought to return to this show for another listen. I think it will do nicely. Worth noting (and perhaps hunting down), there happens to be a Matrix (SBD/AUD blend) out there too. This is fantastic work. Hopefully, many more will find a path to excellent music by visiting here. great - great show indeed. This blog is truly what has been lacking in so many of my "trades," an actual knowledgable, deadhead. Its so easy for one to go to bt.etree or thearchives and clicky clicky your way through dates and ratings and 2 sentence comments which really don't mean much. It's like a designer drug, this blog. I was always more into 72 and 73, never really seeing what the big deal was with 77. It was this show that eventually turned me around. I learned to stop worrying and love 77. I hadn't seen the matrix, and I love a good matrix. Keep up the incredible work. You are a Deadhead's Deadhead! If this is not my very favorite GD show, it's probably the one I listen to most often, the one I never leave on a long trip without, etc. -- so stunning is it every time! That said, and regarding your mention of 3/18 and 3/20, I've found that my love for this show has actually enhanced my feelings about the dates that surround it. These three shows mark the differences one gets in a run of shows, a gamut marking the band at the beginning of a behemoth year. Phil is an absolute monster on 3/18 (particularly emphasized in the recording I have, where he's pretty high in the mix), and though 3/20 is shorter, it's got a lot going for it, too. Completing this triage totally brings me a greater love for all three shows, in other words. i was just thinking to myself that i really need to find a knowledgeable head to chat with. and i also do not listen to a lot of '77. much prefer '72. really like what i have read so far. Chris, Glad that you've found your way here. I hope these pages can help turn you on to some interesting stuff. For a while I would only listen to '68-74. But then I expanded that to '77 and eventually early '78. '69-72 are my favorite years, followed by '77. '73 annoys me a bit because of Weather Report Suite being played at nearly every show. In '74 they seemed to slow some of the songs down. I do enjoy '76, but I believe Jerry's guitar playing and Keith's keyboards hit a peak in '77. For me Keith never really stood out but in '77 his keys are lively and make a difference. This carries over into early '78, but then it starts to go downhill. I read that Jerry and Keith were both dealing with addictions by mid-'78, and this led to Keith's eventual departure. But I am a big fan of '77.